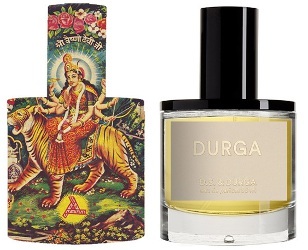 Reviews of two recent florals: Durga by DS & Durga and Don't Tell Jasmine by Vilhelm Parfumerie. If you asked me what notes I'd like you to add to "palatial doses of the finest floral absolutes", melon and chrysanthemum would not be high on my list of suggestions. They do, admittedly, make this a rather unusual fragrance, and not what you'd expect from what are otherwise the usual suspects in a feminine white floral: tuberose, orange blossom, sambac jasmine, ylang ylang. I can imagine the right person falling in love with Durga, the latest release from indie brand DS & Durga, but I found the melon vaguely disturbing (as I usually, but not always, do) early on, and as Durga dried down, the chrysanthemum seemed to blunt the impact of the white floral notes. The later stages felt like a push-me-pull-me, with the chrysanthemum trying to drag Durga out of the hothouse and into fresher and greener wildflowers-in-the-field territory, and the heavily-powdered iris base pulling it back towards the dressing table. Durga by DS & Durga is $350 for 50 ml Eau de Parfum. For buying information, see the listing for D.S. & Durga under Perfume Houses. I initially regarded Vilhelm Parfumerie with some skepticism — at this point, I regard all new niche brands with some skepticism — but the few I've finally tried have impressed me. I believe they work (mostly? only?) with perfumer Jérôme Epinette. Jessica noted when she reviewed three of Vilhelm's early fragrances (Opus Kore, Room Service and Morning Chess) that the brand reminded her of another niche brand that has used Epinette's services, Byredo (yep, me too), but that she generally preferred Epinette's work for Atelier Cologne (and now we part ways). Based on admittedly limited data (I missed many of the early Vilhelm and later Atelier fragrances), I'll put my money, at least in the theoretical sense, on Vilhelm Parfumerie. I know I'm swimming against the tide here again, but with a few exceptions, Byredo and Atelier mostly leave me cold. Don't Tell Jasmine is an exuberant floral that lives up to its name: if you don't love jasmine, there probably isn't much point in trying it. The jasmine is given a treatment that's similar to what they did with the fig in Purple Fig: a bright lemon-y citrus opening, then plenty of cassis, diluted here to what they're calling "kir". It's lighthearted and cheerful, but it's not a sheer fragrance; the jasmine is big, full, fruity, and it packs plenty of sillage and very good lasting power. It's what I'd call mildly indolic, but of course your mileage may vary. It's also sweet, although nothing like so sweet as say, Lush Lust. Verdict: Great fun for jasmine freaks, and I will use every last drop of my lab sample. It would easily make my buy list if it were not so expensive — something else Vilhelm has in common with Byredo and Atelier Cologne. 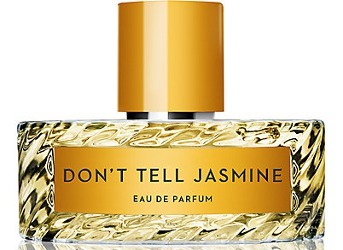 Vilhelm Parfumerie Don't Tell Jasmine is $245 for 100 ml Eau de Parfum. The brand does now sell 18 ml travel sizes of most of its perfumes ($80) so that may be still to come. You can find the brand at Barneys or Liberty of London. Saving Durga as my sample for tomorrow, but just sniffing from the vial, there’s something about it that reminds me of Amoureuse. Maybe I’m reading the melon as honey or maybe it’s the strength of the juice itself, which seems similarly impressive. Did you find Durga to be a sillage bomb, like Amoureuse? No, it’s not sheer either but I found it much quieter than Amoureuse — but will look forward to hearing what you think, maybe you’ll have a different experience. I’ve also been considerably underimpressed with Atelier Cologne. I am of course a terrible snob, but I would say both Atelier Cologne and Byredo started off well enough and got ruined by the enthusiastic response to what were just decent, far from genius fragrances. Both brands have done way too many fragrances now, way too quickly, but what do they care — people will apparently buy whatever they make. DS & Durga started off a scrappy little indie brand but now they’re in Barneys. What can I say. I sometimes think the best thing any brand can get is an enthusiastic but small and slow-growing following. Robin, I’m wondering if you can shed any light on why some of these brands like Atelier et al are pumping out so many releases on the heels of the previous ones. I can’t rely upon my normal assumptions, because this doesn’t make sense to me. From my perspective, this doesn’t work, but I’m not the average consumer. But I’m guessing that it has proven to work for these companies, or they’re hoping it will based on projections derived from data. Are these consumers loyal to a brand, and therefore going to pursue their new releases instead of exploring other brands? I think in today’s consumer climate, where many consumers are buying wardrobes more than signature scents, it is not a bad idea if what you’re after is making money. If you have enough fragrances, and they sell well, you get a nice big display spot on a fragrance counter instead of having your testers lumped in with a mixed bunch of brands on a little tray. And if you charge enough money, even for little citrus Eaux, people assume the fragrances must be of really high quality. Throw in some personalized leather sleeves — hey, who would do personalized leather sleeves for a junk citrus? This sort of luxury strategy has worked very well for other upscale brands — just look at Tom Ford Private Blend. Plus, when everybody else is doing it, and you aren’t, you’re forgotten. Consumers want newness. Five years ago, if a brand put out one fragrance a year, you still remembered the last one when the new one came out. Now, if you wait a year, people have nearly forgotten you exist — after all, 2000 new fragrances have come out in the meantime. But the question might be — do you want to make fragrances that matter, or do you just want to make money? I’m sure for most brands, the answer is easy, but I have more and more respect for the old school brands like Frederic Malle that don’t rush, and don’t generally release stupid fragrances, and that put serious efforts into promoting each fragrance. I can name five FM fragrances that I think are masterpieces right off the top of my head. I do like a few Atelier Cologne fragrances, but masterpieces? No, not a one, and yet they’ve probably released more fragrances than FM already, in a fraction of the time. Ack, sorry — I do go on, don’t I? No, Robin, you don’t go on! I was on the edge of my seat reading your opinion! Everyone here rates you highly, and your writing style is rational and informative!!! Nope, we’re gonna keep encouraging you! Thanks so much for sharing your thoughts and also posting this article. I was so looking forward to a review about this particular scent. I smelled it the other day and couldn’t tell if I liked it or not. I eventually settled on: it’s not for me. Something about it didn’t quite work. Maybe it was the melon. Not sure. It’s not awful or anything, just didn’t smell like a perfume. So thanks for the vindication. A few people have mentioned (in the scent of the day polls) wanting to buy it, so it is finding fans — but “something about it didn’t quite work” is my sentiments exactly. I’ve tried several scents from DS&Durga and haven’t liked any of them. Of course their ‘2 hip 4 u’ messaging seriously gets on my nerves, which I’m sure affects my viewpoint. Clearly I am not their target demographic – lol. Like you, I really enjoyed Vilhelm’s Purple Fig. Bought the travel size of that one, and Dirty Velvet too (another fig! you’d think I’d have enough fig scents by now. Nope) I sure wish they’d make it easier to obtain samples of their scents though. Their marketing strategy baffles me. I know exactly what you mean — the messaging does verge on that particular kind of Brooklyn hipster / artisanal preciousness. It annoyed me less before it became really expensive. I have paid zero attention to Vilhelm’s marketing strategy. Don’t even know why they are so narrowly distributed (that is, if it is by choice or ?) but in the US, no easy thing to get samples if they’re only at Barneys. Thanks for the reviews! I tried Durga on paper but missed any of the weirder nuances. It just smelled like an orange blossom/white floral on the sweet side. I’ll have to commit to skin next time. I really liked DS& Durga like 10 years ago when they were small-and I loved and bought My Indian Childhood. I don’t know which scents are still around from then, but I thought they were great at the time, possibly because I wasn’t exposed to much yet, or they were more interesting, or less competition around. I’ve been craving jasmine lately so will check out the Vilhelm next time I’m at Barney’s but Vilhelm already fell prey to my cynicism when they released a whole bunch at once straight to Barney’s when they debuted. My impression then was either meh or screechingly synthetic for a lot of them and way too expensive. Very cute bottles, though. Living in the heart of Twee Preciousville may also contribute to my cynicism and hypercriticism. I mean how often can you eat porkbelly tacos with ramps and vinegar reduction?! And they take themselves so darned seriously. They have definitely done some interesting scents, and I thought the Hylnds series was particularly nicely done, although not likely to sell — maybe more interesting than wearable? The last 3 before Durga struck me as swinging perhaps too far in the other direction. And since I missed most of the early Vilhelms, I should probably not make any sweeping generalizations! I just thought Purple Fig and Don’t Tell Jasmine were fun, and gosh, so many niche brands are so NOT fun these days. But I do agree they are way overpriced. I have a harder time getting up in arms about that these days since everything is so darned overpriced ($245 for 100 ml seems awfully reasonable next to $350 for 50 ml). But I wouldn’t buy anything from Vilhelm at those prices. I see now that I overlooked this comment by Elisa P and posted below, but I totally agree on what both of you said on DS & Durga. I guess I am old school when it comes to brands that launch 10 different fragrances at once or other lines like Byredo who has a new fragrance every couple of months. I prefer brands like Chanel, Vero Perfumo, Malle, Andy Tauer who don’t churn new fragrances out every other month, but once they do introduce something new, it is usually very worthwhile and I am anxious to try it. But agree with the sentiment. What is with all this aspirational pricing? I know it’s not a new trend but suddenly, I’m very annoyed. I know these are business but unless you’ve included both ground diamond, gold flakes, and it comes in a platinum plated bottle…no. I’m apparently very cranky today. It’s where the growth is: budget fragrances and luxury fragrance. There is little to no growth right now in mainstream prestige, and many brands have actually slowed down their launches in that arena. It’s one reason you’re seeing more small niche brands getting trials at department stores like Bloomingdales and Nordstrom. I used to like DS & Durga a lot. I believe Moltz is very talented. And even if they started to go too expensive with their Hylnds, those were still good (Isle Ryder is my favorite). But Durga? I am glad you said “it’s interesting,” and I tried my sample once again to find it, but I have to admit that I don’t get it. I do like trashy tuberose (from Versace Blonde to Vamp a NY), but I find Durga and $350 to be a joke (hopefully I am wrong!). Part of the issue is the brand implying that it’s a tuberose scent — wish they had not done that. It is not, to me, a tuberose, or even a white floral. I’d almost, but not quite, call it an iris before I’d call it anything else. But if the price is $350 because of the “palatial doses of the finest floral absolutes”, I feel like they wasted the absolutes. Yes, they did, and I wish DS&Durga is still “a scrappy little indie brand.” Even their Longshoreman’s for J Crew (and that was not that long time ago) was very good + reasonably priced.